remarkable Neolithic tomb and going all the way to the Second World War. The site itself is small and pretty, nestled on the east side of the island and surrounded by fields. The museum hosts the island’s archaeological and geological collection and the recently added ‘Treasures of the Island’, a permanent exhibition which tells the exciting story of the newly discovered coin hoards. The Neolithic tomb offers the rare opportunity to actually step inside one of Europe’s finest Neolithic passage graves. As you bend down to enter the chamber, feel the thrill of connecting with life from 3500 years BC. Chilled and dark, the 60 foot long passage is lined with vase supports on either side, indicating that the site’s prime function was probably ceremonial and not necessarily only for burials. Twice a year, during September’s autumn equinox and March’s spring equinox, rays of sun traverse the whole way through the corridor, reaching the very last wall – a spiritual experience for some. Don’t look for the Prince’s Tower as it is not there anymore! But do look up as it used to be located at the top of a curiously high earth mound, where a tiny medieval chapel still stands. 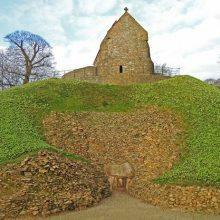 You might be a bit confused but the charm of discovering La Hougue Bie definitely lies in deciphering its random history, piecing together bits of information and, in the end, making up your own mind as to how this chapel is still here today. The ‘official’ story though is that the 36 ft earth mound was created to sit atop the Neolithic tomb. A chapel then appeared in the 12th century – was the place always considered sacred or holy? – followed by a second in the 16th century. These two buildings were subjected to many transformations, the most dramatic one being masterminded by Prince Philippe d’Auvergne in 1792, who transformed it into a Neo-Gothic mini castle complete with a tower. In 1924 the Prince’s Tower was demolished and only the chapel itself, although altered by D’Auvergne, remained. The top of the mound was recognised as a stategic point by Philippe d’Auvergne who had also erected a signal mast on top of it. The occupying Germans made similar use of the height during the Second World War and buried a bunker on the side of the mound to work out their observations. The entrance to the bunker is hidden but don’t miss it as it now hosts a commemorative exhibition dedicated to slave-workers brought to the island during the war. La Hougue Bie is a fascinating place to spend a few hours pondering on history. It is a spiritual, romantic, historical and compelling site where everyone will find something of interest, from running around for children to perusing the museums for adults. This entry was posted in Places to Visit and tagged La Hougue Bie. Bookmark the permalink.